Grandmere's Tresors translates to Grandmother's Treasures. And treasures they are! A beautiful tall french display cabinet with the most lovely thin legs will be prepared for lighting, stripped and gold leafed. The back oif the cabinet will be lined with a beautiful creme silk fabric. 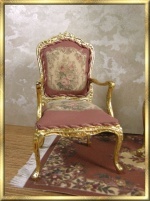 An exquisite French chair will also be gold leafed. 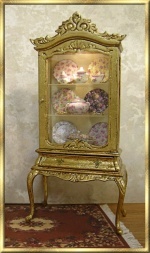 You will receive the gold leafing materinals, including adhesive, sealer, antiquing stain and a pair of cloth gloves. A package of 25 gold leaf sheets will also be included. This is enough material to do this project and several additional pieces, and once you see how much fun this is, you will definitely want to do more. We will be adding a LED light to the interior of the cabinet. The chair will be upholstered with my original fabric design, a copy of an antique aubuson pattern. You will also learn to make the lovely two color twisted cording. Finally, you will learn to fringe and back the pre-printed rug. Students will provide scissors, glue, brushes. 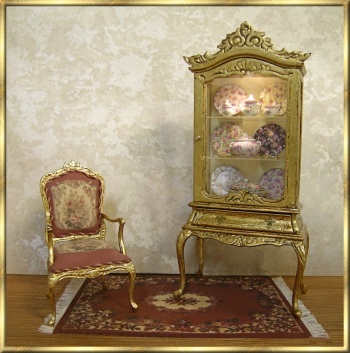 Please note that the china shown in the cabinet is for display purposes and is not included in the kit.